Please note that the Hour of the Lunar Eclipse is Venusian (which was left off the chart mea culpa!) and transit Venus @16Can15 will have conjoined the degree of the July 2nd Solar Eclipse (10Can37) and that the transiting North Node of the Moon will conjoin the Solar Eclipse degree near mid-July 2019. 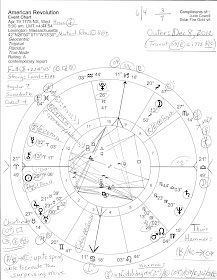 Also note that Solar Eclipses in Moon-ruled Cancer reveal that emotional extremes block karmic progress and the urge is to withdraw emotionally from eclipse affairs and events--to hide in Cancer the Crab's shell (Lineman). Yet we know that an accompanying Lunar Eclipse reveals something about our reactions to the karmic conditions and events indicated by the Solar Eclipse. In July 2019, the Solar Eclipse is Total which has the strongest influence and/or is most widely ranging in its effects (for eclipse posts I go by degrees and not so much by the patch of visibility because I've been affected by too many eclipses that I couldn't 'see'). The Lunar Eclipse is Partial which suggests weaker efforts being made to deal with issues, or that efforts may fall short of their intended aims--that constructive efforts may be lacking or partially lacking. 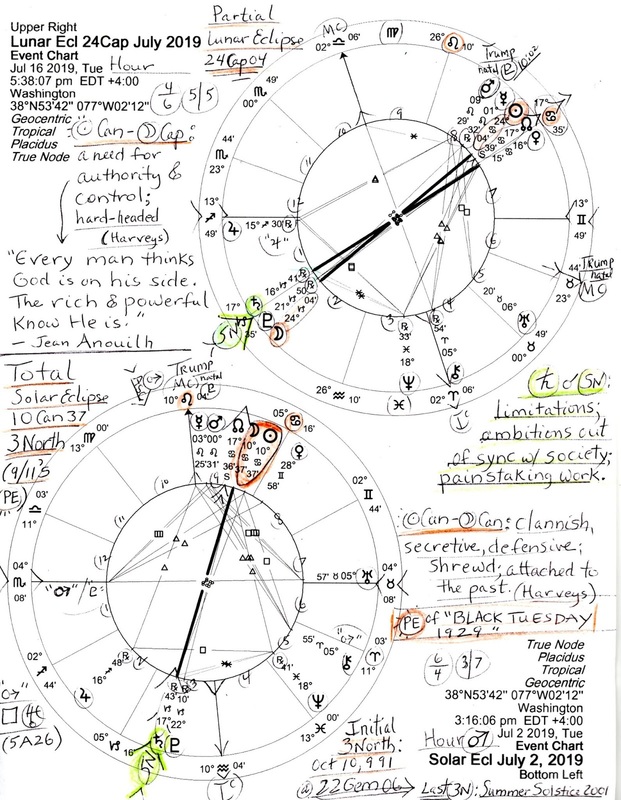 With Saturn-ruled Capricorn, some element of control or a form of limitation may be on the emotionally based solar agenda which occurs so near America's Independence Day that the eclipse is 'personalized' for the US. Finances delayed? Budget strife on Capitol Hill and/or perhaps the US dollar losing more of its global sheen? Limitations on economic policies? Well naturally, eclipses across the Cancer-Capricorn polarity relate to security issues, Career vs Family and Home situations, and to ambition, strategy, and direction taken in the realms of Business, Government, Law, Finance, and Investment. Also notable in such realms is the conjunction of Saturn with the South Node, the 'tail of the dragon' @17Cap36/43. Please enlarge the image to read my notes on this difficult and limiting hook-up highlighted in green and penned on the right side of the image. 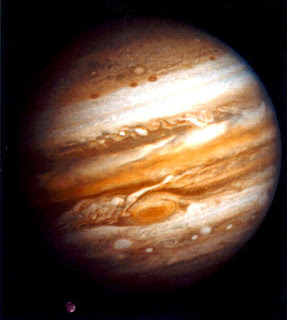 And as you see in the Lunar Eclipse chart, the 2/8 axis of Money, Values, Finances, and Big Business is where this conjunction clusters which suggests the necessity to rise by force via self-reliance--and this tallies with transit Uranus in money sign Taurus where new sources of income may need to be found. 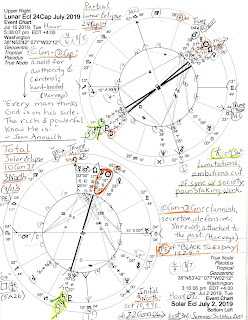 We will certainly know more of such issues by the time of the Saturn-Pluto conjunction in Capricorn on January 12, 2020, an indicator of a 'new social order' and which conjuncts the natal Vertex of fate for Mr. Trump. And finally, 3 North Solar Eclipses also manifested in the years 1911, 1929 (3N is the PE of 'Black Tuesday' 1929), 1947, 1965, 1983 (Reaganomics! ), 2001 (the PE of 9/11/01, as noted on the chart), 2019 (this chart), and will next occur in 2037. 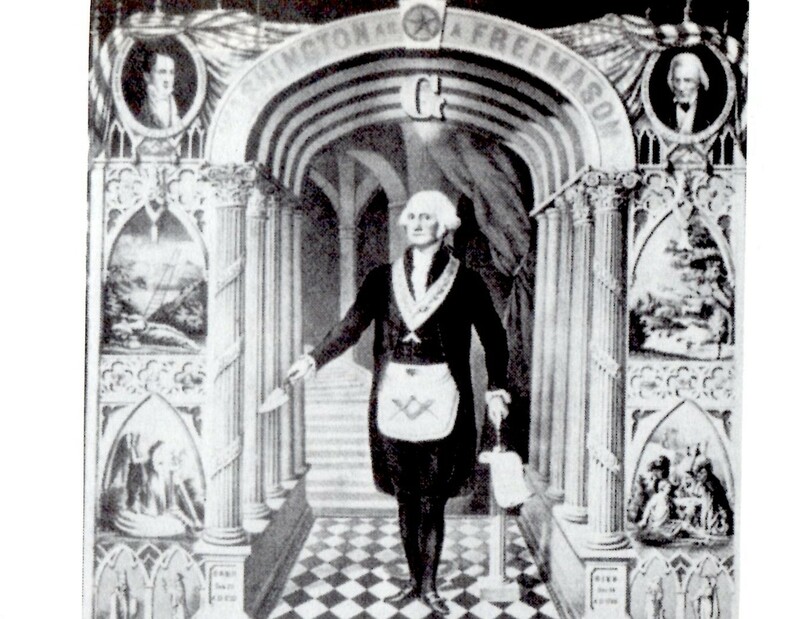 3N's initial eclipse manifested on October 10, 991 @22Gem06 conjunct what became US natal Mars so military and war issues cannot be ruled out in 2019 under Donald Trump whose natal MC (The Goal Point) happens to conjoin the Lunar Eclipse's 6th cusp, the house of Military, Police, and Civil Service.